4082 / 5000 words. 82% done! Unfortunately, I’m apparently not a very good English major, because I must use little words. The above word count only represents 10 1/2 pages. I was hampered by a fairly busy weekend (wedding shower, BYU football game, etc. ), and yesterday I didn’t get nearly as much work done as I should have, because I felt a little sick. Turned out I’d put my contacts in the wrong eyes that morning, which had given me a headache, which made me dizzy, and so on, and so forth. So my grand total wasn’t as much as it should have been. However, Dr. Walker was pleased with what I had gotten done. 10 1/2 pages, after all, is better than no pages at all. We talked about what I planned on doing further (I started in the middle, so I have to go back and write the introduction, lay a foundation, etc. ), what sources I planned to bring in, where I needed more commentary, and stuff like that. He wants a full first draft by Oct. 13, two weeks from today. He would have wanted it by next Tuesday, but I’m leaving for Disneyland that day, so that won’t work. Even though I didn’t fully meet my goal, I’m still really proud of myself. After 5 years of work, I finally have something to show for it. 10 1/2 pages of my own writing, on my thesis topic. 0 / 5000 words. 0% done! I have officially applied for December graduation. Also talked to my thesis advisor today. He wants 20 pages by Tuesday. That’s approximately 5,000 words. So I stole a NaNoWriMo progress bar. 5,000 words by 2:00 Tuesday. I think I can, I think I can, I think I can. . .
I’ve been meaning to write a good LJ post for ages now, but I’m so out of the habit it just keeps not getting done. But dude, I’m going to do it. So. Here is an update on my life, broken up into easy-to-read sections. If you’re not interested in certain things, feel free to skip. For that matter, feel free to skip the whole dang thing, ’cause I’ve been gone so long I doubt any of you care any more any way. Still unemployed. I’ve been applying for the minimum required jobs to collect unemployment benefits (2 per week), but to tell the truth, it’s hard finding even that many jobs to apply for. And since there’s a glut on the market of experienced admin-type people, they’re all asking for oodles more experience than I have, and can choose to be incredibly picky. I’ve only had one legitimate interview request so far (the rest have been for scams and/or telemarketing companies), and while the interview went well, I wasn’t among their top candidates brought in for another interview. It’s okay right now that I’m not having any luck finding work, but it does have me worried that when I do get seriously serious about looking for a job (i.e., when I finish my thesis and/or my unemployment runs out, whichever comes first), there still won’t be anything out there. Most of the previously good sources of jobs are on hiring freezes right now, and who knows how long those will last. Ah, well. C’est la vie. So since I’ve got all this free time on my hands and the absolute drop-dead deadline for my thesis fast approaching, I’ve been concentrating on getting that done. I’ve actually made a bit of progress– still no official first draft yet, but I’m hoping to get it done by the end of the week. I have until Oct. 30 to schedule my defense, and Nov. 13 to actually defend, in order to graduate in December. As an accomplished procrastinator, having an actual deadline is great motivation. I’m also in a much better frame of mind still, and have been able to get work done. Not as much as I would like, and I still am having trouble getting motivated to just sit down and do it, but still. Some progress is better than no progress at all. When I’m not working on my thesis, I’ve been mostly re-reading old stuff: Georgette Heyer galore, Shannon Hale, Jane Austen, L.M. Montgomery, Robin McKinley, etc. Oh, and re-reading Harry Potter. Did you know that those books are delightful? And J.K. Rowling is a genius? Yeah, I’d almost forgotten just how wonderful they are. Not quite, but it’s always nice to be reminded. I’ve also read some new stuff, though, especially The Hunger Games and Catching Fire (Suzanne Collins is EVIL. EVIL, I TELL YOU). Thanks, Pam, for giving me a new literary obsession. I’ve also been trying to *beep* rj_anderson‘s Spell Hunter wherever I can. I actually found it on the shelf at the BYU Bookstore the other day, so I was finally able to fulfill my dream of taking it off the shelf, walking to a cashier, and proudly telling them “my friend wrote this!” as I purchased it. Now I have a hardcover that isn’t signed, so I can trash it with multiple rereadings and/or lend it out without worrying too much about it not coming back. I do manage to watch some TV as well. Right now I’m loving Leverage on TNT (we started watching it because of Timothy Hutton, who we all fell in love with after seeing him as Archie Goodwin in the sadly short-lived A&E Nero Wolfe Mysteries series), which has some wonderfully geek-tastic references in it some times (like when Nate’s stash of fake IDs were all names of actors who had played the Doctor :P), recently guest-starred Wil Wheaton (who they referred to as the Kobyashi Maru!) and is just plain fun. We also discovered Lark Rise to Candleford on our local PBS station, which sadly has only aired the first season so far, and shows no signs of airing the second yet. But who wouldn’t love a BBC costume-drama series? Loving the final season of Monk (He’d better solve Trudy’s murder before the end, goshdarnit!) and excited to get Numb3rs back in the fall. Have also newly discovered NCIS in reruns. Gibbs is the bomb-diggety. Because I am nearly constitutionally incapable of sitting in front of the TV without doing something else at the same time (which is why my laptop gets so much use :P), I’ve also been getting some knitting done, finally. Unfortunately I’ve been a lazy bum when it comes to taking pics, so I can’t show stuff off at the moment, but I’ve recently finished a Dalek for R.J. Anderson, a beautiful lace scarf an equally-beautiful lace beret, a baby blanket for my 9-month-old niece, a baby hat for Jen’s darling girl, and several dishcloths. My queue of projects I want to do is still incredibly long, I have at least 3 started-but-not-completed projects on the needles at this moment, and my yarn stash is starting to get out of hand (as in, I need to think of another storage solution for fitting it AND all my books in my bedroom. It’s not going well). Oh, and did I mention that I’m trying to get a Jane Austen/Regency gown sewn in time for an early-October Disneyland trip? When my queue will shrink I have no idea. In the meantime, my sister decided to go back to school after being let go by my former employer (it’s a long complicated story, but suffice it to say she got the shaft and was treated absolutely terribly by a company she’d given 3 years of loyal service to) and has moved in with her twin in Provo to cut down on commute time, leaving me home alone with the parents. It’s taken a bit of adjustment. My nieces and nephews continue to be the brightest spot in my life– they are all just adorable in their own ways. Anna is 3 now, and is extremely verbal and smart. At the moment she is obsessed with various Disney movies (although Beauty and the Beast is , I think, her favorite, she also loves The Little Mermaid and Pinocchio right now) and can sing a lot of the songs all by herself. Her little sister Molly is 18 months, and is our only brown-eyed grandchild so far. She’s just starting to string more than two words together, loves crocheted/knitted blankets, and has a decided sweet tooth. My nephew Thomas will be 3 in November and is the most adorable little boy EVER. He isn’t as verbal as Anna, speaking mostly in one-word phrases (“juice!” “car!” “broken?”), but he’s a smart little cookie as well. He loves cars and Curious George and Thomas the Tank Engine. He’s got the biggest blue eyes and his eyelashes absolutely SLAY me. Abigail is 9 months, and is an absolute cabbage patch doll. She’s chunky and cuddly and kissable and is generally a very happy baby, except when she’s not. She’s crawling and pulling herself up and is loving eating solid food, and does this adorable thing where she scrunches up her face and breathes through her nose at you. My mom’s going to go back east (Illinois and Wisconsin, mostly) with her parents and sisters this week, so I’ve been helping her can the harvest from our garden and the various other things we do each fall. So far we’ve got frozen corn, canned beans, tomatoes, V8 juice, beets, pears, and peaches. When she gets home we’ve got more peaches, beans, apples, taco sauce, chile sauce, and who knows what else. I love having fresh produce from our garden. While mom’s gone I’ll be chief cook. The menu is spaghetti, fajitas, chicken pot pies, Chicken Azkaban, and probably take-out. One of the days she’s gone will be a football game, and I’m not sure if I’ll pack some sandwiches or if we’ll just buy something there. Gotta consult my dad on that one. Speaking of football– home opener for BYU is this week. We’re taking on Florida State, who we should be able to beat judging by their last two weeks. I love home football games. Nothing’s quite like sitting in the stadium with 64,000 other insane BYU football fans. *sigh* I love fall. So, that’s my life in a nutshell. I’m really, really going to try to update at least once a week from here on out. So, yesterday was the 1-week anniversary of my layoff. I didn’t even remember until I was in bed for the night. It’s been an interesting week. No, really. I’m actually quite surprised at how well I’m taking it. I really have been able to look at this whole thing as a gift, rather than as a misfortune. Of course, who knows how long this will last– maybe when my savings account starts looking much more meager than it is now. But for now, I’m fine. Some of it, of course, is because I’m in such a different situation this time around. While the layoff was just as sudden– or even more so, since I got about 20 minutes notice before I clocked out for the last time– I’ve been sort of mentally preparing myself for a while, just in case. I also got 2 weeks of severance pay and all my unused vacation, which I <i>didn’t</i> get last time. My unemployment payment will be higher and extend for a longer period of time, since I worked more last year for more pay. I qualify for COBRA, and also for the federal COBRA subsidy, which means I’m guaranteed my current benefits for at least 18 months for only a little more than what I’m currently paying. I still live at home and have relatively few expenses (a student loan and a credit card payment, and that’s about it), so I’m not too worried about my finances. And mentally, I’m just in a much better place. I’ve been seeing a therapist for several months now, and have been taking an anti-depressant. And when I attended Teri’s wedding (which was AWESOME, and which I was in the process of writing about when I got laid off and therefore distracted), I spent the weekend either talking about theology and my thesis with Cally and Melanie or writing processes with RJA and Risti, or both, I came home ready to GO on my thesis. No, I haven’t written anything yet– I’m still trying to get my room clean so I have a pleasant place to write– but I’ve got ideas. I’ve got plans. I feel a definite need to make my voice heard on this subject. And now I have all the time I need. Last time, I was so worried about finding a new job that I still couldn’t write. This time, I’m not going to worry. I’m going to seize the time I’ve been given, this wonderful chance to finish my thesis before time runs out, and run with it. I’ll apply for jobs, of course, but only the minimum needed to keep my unemployment benefits. If I get one, great. If not– it’s okay. It really is. Not that I don’t miss my job. It was a great job, with great people. Hopefully the powers-that-be who decreed that I had to be let go will come to their senses and realize how much they need me, and I can go back. If not– there’s going to be something around the corner. Maybe even something better. Who knows? For right now, though, I’m okay where I am. And that’s a wonderful feeling– one I haven’t had in a long, long time. Well, that was nice while it lasted. Today was my one-year anniversary at work. This afternoon, at 4:40, I got laid off. And I really should have told all you about it sooner, but I’ve been either incredibly busy or incredibly tired, and therefore haven’t had the opportunity. In fact, I should be doing laundry right now, but I decided to tell you instead. It was completely unexpected. You see, two Fridays ago, my boss announced to us at staff meeting that, rather than having to lay two of us off, she was cutting all of our hours to 32 per week. Sucky, but better than losing any of our coworkers, or, worse still, losing our jobs. But then on Monday, it all turned around. One of our team members was moving into a newly created position, which, with one other TM going down to part-time, was enough to give us back our hours– if we shuffled responsibilities a bit. The TM that left was a trainer, and sometimes worked irregular hours, so they needed someone fairly flexible to replace her. I was elected. Well, kind of. We split her responsibilities between the other trainer and I (with him taking the more senior role and me taking the more administrative tasks), and the second Admin Assistant in the department moved out to the front desk. So now, instead of being the receptionist/HR admin assistant, I am now the Training Coordinator. I’m still responsible for the benefits, but I’ll also handle tracking of the various types of training we do, teach new employee orientation, administer training audits, maintain the training manuals, and various other training throughout the theatres. It’s new and exciting and scary, and I feel like I have so much to learn (probably because I DO have a lot to learn, having never done this sort of thing in my life before), but it’s good. I think I’ll quite like it. Larry H. Miller, owner of the Utah Jazz and my own workplace, Megaplex Theatres, passed away today. He’s been ill for quite some time– in fact, it was only about a month after I started that he went into the hospital with a heart attack and complications to diabetes. Last month, he had both his legs amputated. His son replaced him as CEO at the beginning of his illness, but he still kept his hand in. In fact, I talked to him on the phone just a few weeks ago. My sympathies go out to the Miller family. I wonder how this is going to affect my company. 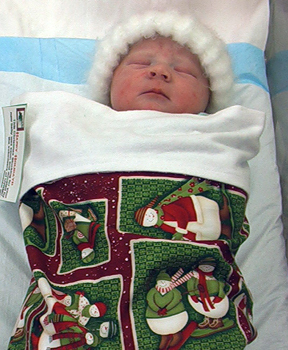 Abigail Diane (probably, with the middle name being pronounced dee-ahn, which is my grandmother’s name), 19″ long, 6 lbs. 14 ounces. Being an aunt is the greatest. Things are actually going sort of well. Amazing! So, what has been good lately? 2) I filled my car up for under $15 yesterday. That is INSANE. C) I’ve been bringing my Doctor Who DVDs to work with me to watch/listen to while I push papers around. Makes my job so much more enjoyable. IV) Speaking of work, I got a fun reward today. My bosses were so impressed with the excellent job I did on open enrollment (Kathy said they’d never had one go so smoothly) that they gave me 4 tickets to Friday night’s Jazz game! And these are primo seats, too– not first row, but lower bowl, high face-value tickets. I’ve never been to a Jazz game before, so I’m quite excited about it. E) My parents, in an effort to help me get more sleep (I had a really bad time for a couple of weeks, when I was stressed with open enrollment, but, as you all well know, I haven’t felt properly awake since at least 2000) spent a, frankly, obscene amount of money to buy me a new mattress. It’s an Intellibed, and it arrived today. I’ll try it out tonight and see if it helps at all. I’m cautiously optimistic– my aunt and uncle bought an Intellibed a few years ago and adore it– but I’ll have to give you an update after I’ve slept on it for a while. I’m excited, though. 6) When I came home from work, I found a package waiting for me from my friend Katy, containing an early Christmas present– a Basil the Basilisk! It’s ADORABLE, and I luves him, and he’s currently curled around my neck. THANKS!! Now, to finish cleaning up all the scattered books and yarn in my room so we can move my mattress onto my bed. . . Between Halloween parties and getting ready for same, it’s been an insane week at my house. But I was saving this title for Halloween week (and one other, which I’ll hopefully post about tomorrow), and even though I missed Halloween itself, I’m still going to post.